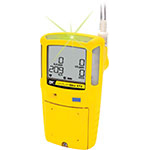 GasAlertMax XT II multi-gas detector now features IntelliFlash, the flashing LED compliance indicator that tells you at-a-glance your gas monitor is functioning correctly. Workers feel safer and incidents are minimized. That means savings realized from business continuity and productivity. In sum, you spend less and worry less, while everyone on the job is able to do more, day after day.